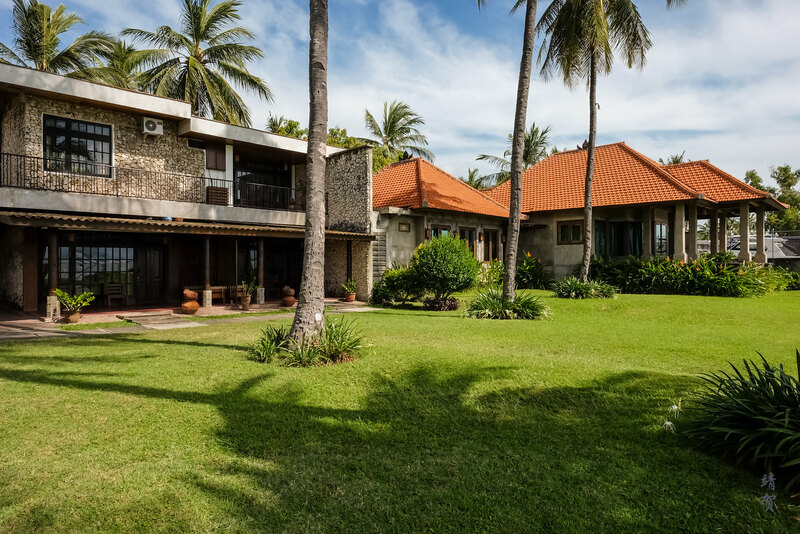 This stay in Banyuwangi was for a business trip and the resort was recommended by our supplier that we were visiting. Banyuwangi itself is one of the growing tourist spots in eastern Java as there are several active volcanoes that travellers can hike to and the ferries from Java to Bali departs from the nearby port. 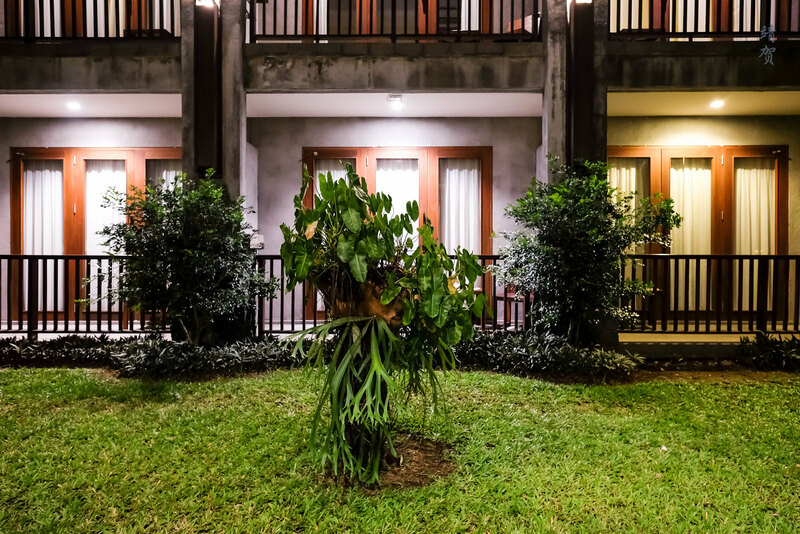 Without any large chain hotels in the area, I booked one night at the Ketapang Indah Hotel online and arrived at the hotel at night after discussing business with our supplier. 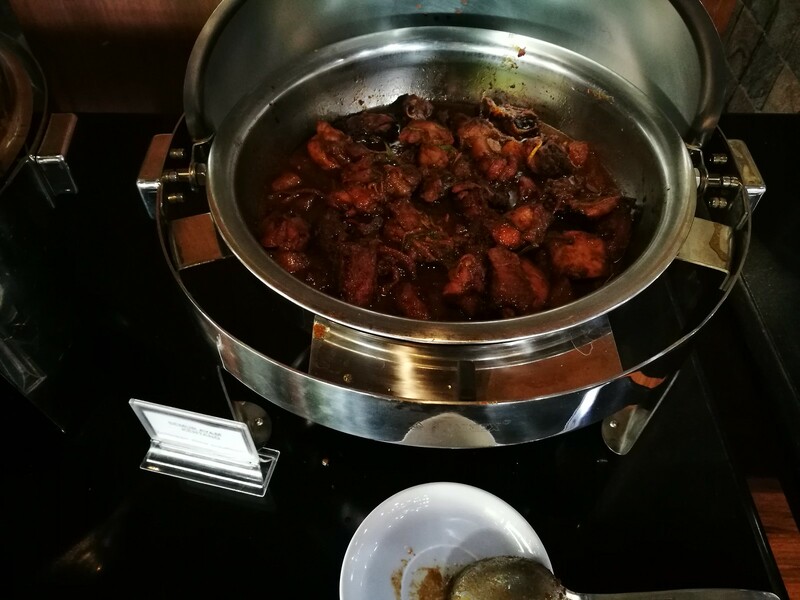 The hotel is actually slightly out of town, and located north of Banyuwangi in the area of Ketapang so there is no other shops or restaurants in the vicinity of the hotel. Arriving in the open air lobby and reception at night was pleasant and there was only one receptionist at night with no other guests checking in. For a small resort, there was no bell boy either but as we were only here for a one night stay, there was not much luggage so it was not an issue. Check-in is conducted by the reception desk with a wooden bench for guests to be seated. Unlike in chain hotels, it was a longer process with them requiring to make photocopies of guests’ ID cards. I figured the system was running a bit slower as well. 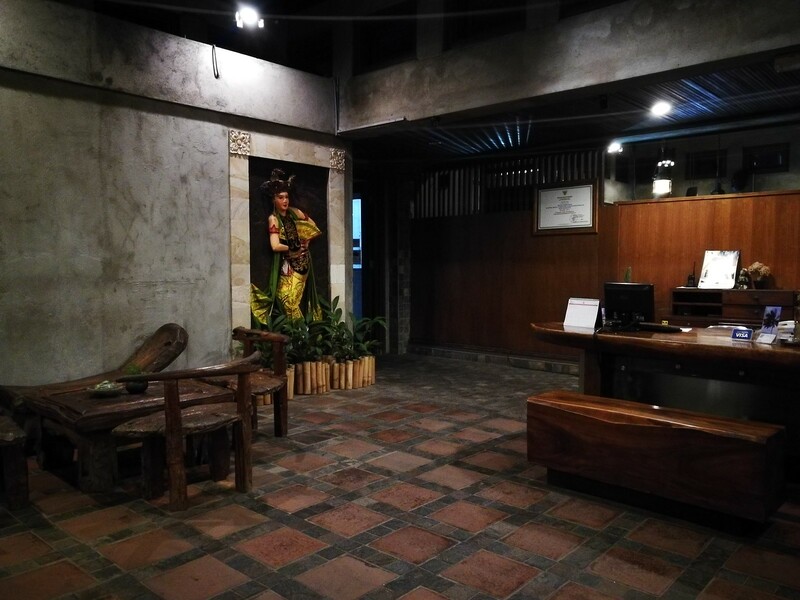 Around the lobby, there was traditional wooden furniture for other guests to wait since they have a pretty small reception area and guests might need to wait during busy periods. 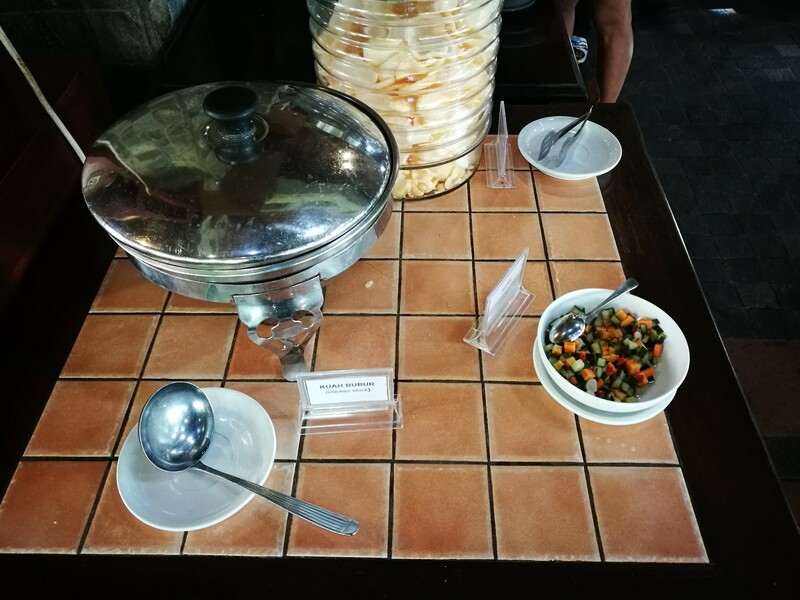 After obtaining our room keys, we were briefed on the complimentary breakfast that was included in our rate and provided an access code for the internet. 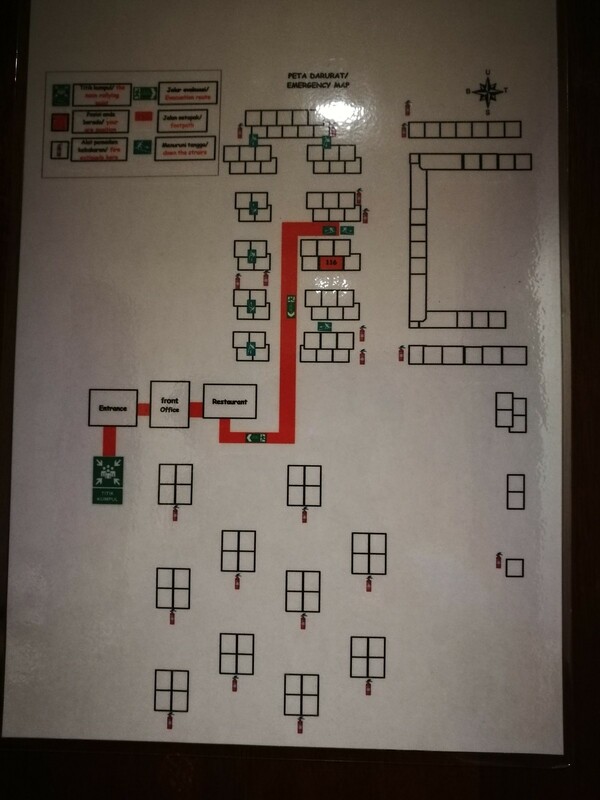 As the rooms here are spread out in different buildings, a staff member showed us the way to the rooms and offered to help with our luggages. 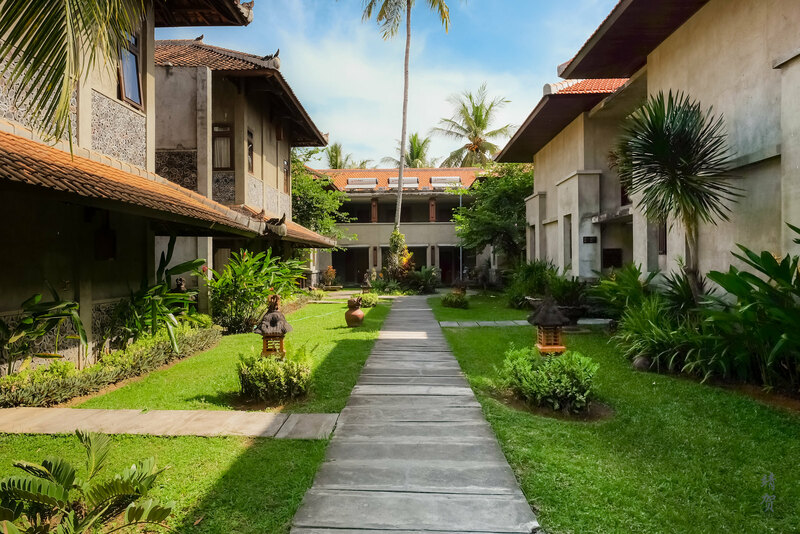 On the way to the rooms, guests will realize the hotel has a large landscaped garden with the rooms spread over the garden. The majority of the rooms lie to the left of the main building which houses the lobby, all-day dining restaurant and several shops. 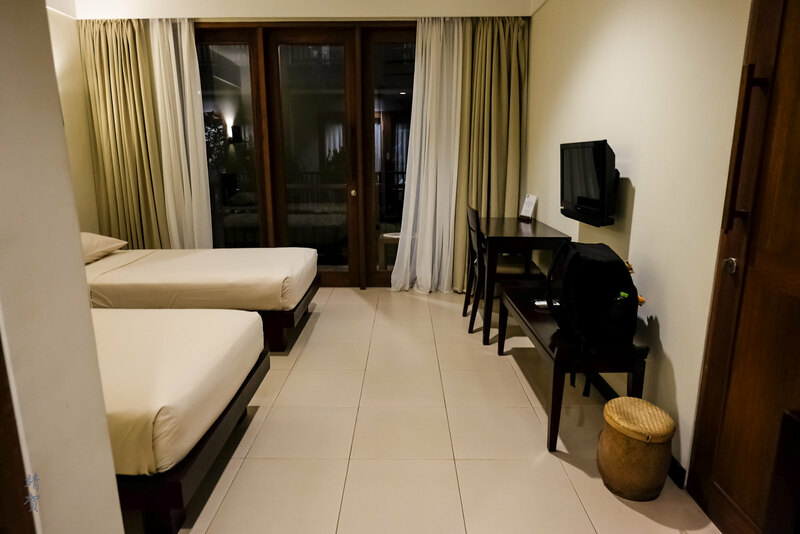 The superior rooms that I had reserved was to be found in a 2 storey building though we has a room on the ground floor which is preferred since it makes it more convenient as there are no elevators around. 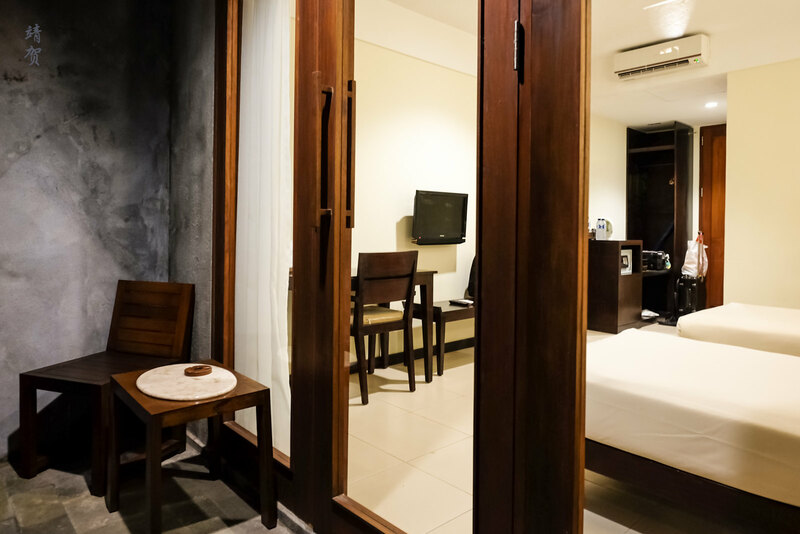 From the hotel’s website, the superior rooms are one level above the standard and most basic rooms. The difference seems to be the decor of the room and probably the age of the rooms. 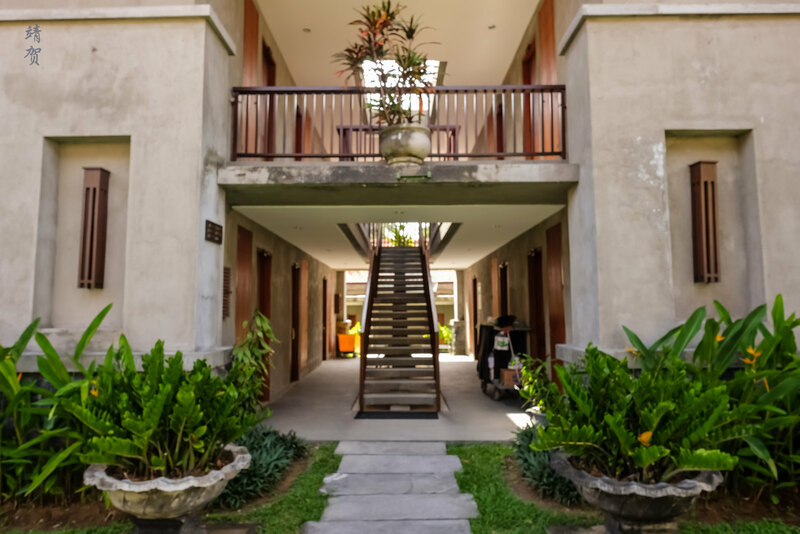 Some of the buildings in the hotel are built older and the two storey buildings seems to be one of the newer buildings constructed. Upon entering the room, it was clear this was to be a basic resort style with ceramic tiles covering the floor. 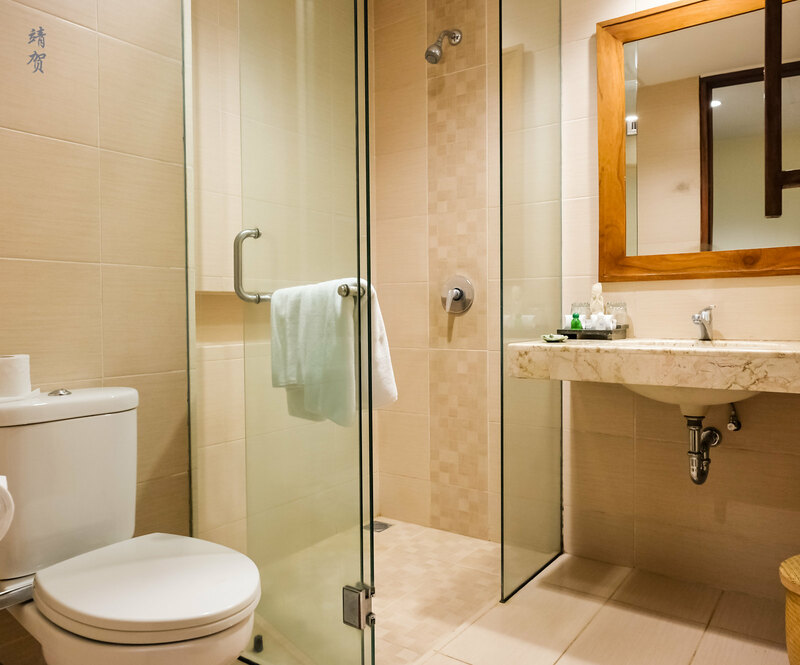 On the left of the door is the bathroom with a modern glass-enclosed shower stall, a toilet and a countertop sink. The size of the bathroom was adequate but nothing luxurious about it since the shower has no handheld shower head and do not expect the fancy rain shower head either. Otherwise it was a functional bathroom with bright lighting and kept clean by housekeeping. That was all that mattered. 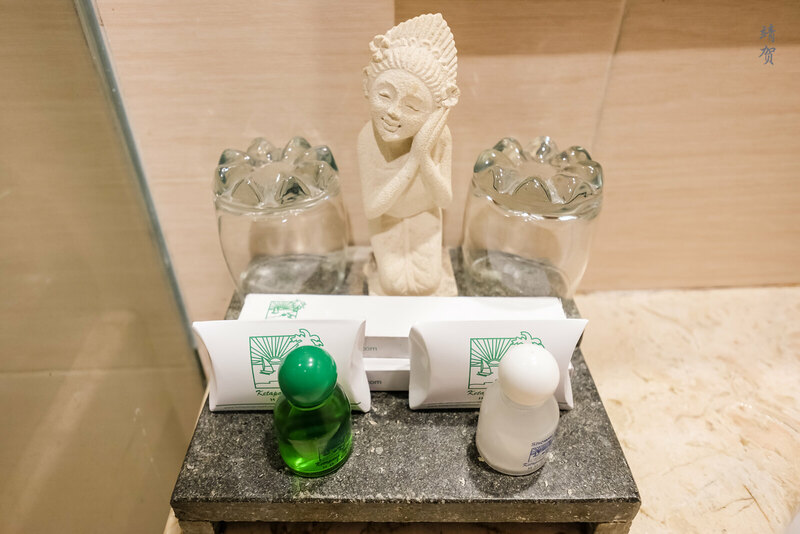 Amenities provided by the hotel comprises of individual bottles of shampoo and shower gel, vanity kit, shower cap and dental kits for 2 occupants of the room. It was basic with the amenities having the hotel’s branding. Across from the bathroom lies the wardrobe with adequate space for 2 guests to hang their towels and clothes. There is a luggage bench with a cabinet containing a safe and an electric kettle. Bottled mineral water was provided complimentary for guests since it is essential in Indonesian hotels. There was no minibar or fridge in the room and I am unsure if one is even available. 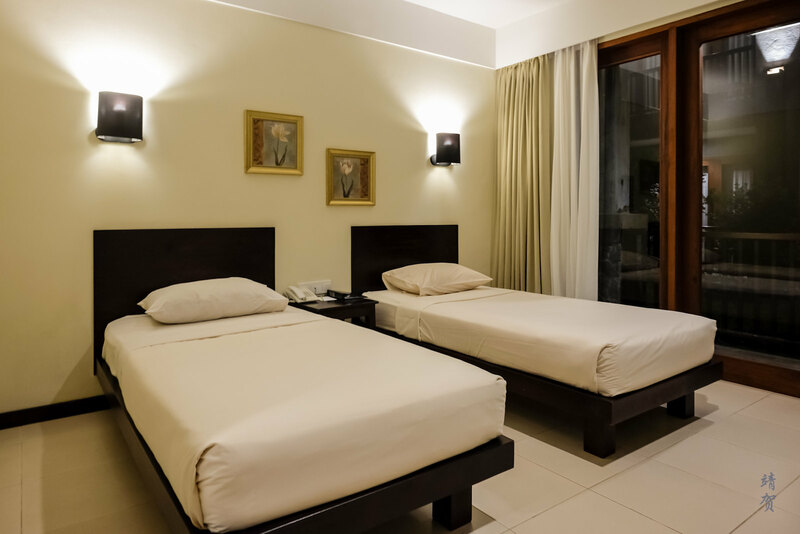 Inside the bedroom, there is 2 single beds with a simple spring mattress and thin sheets. The theme here is basic with simple Ikea design. 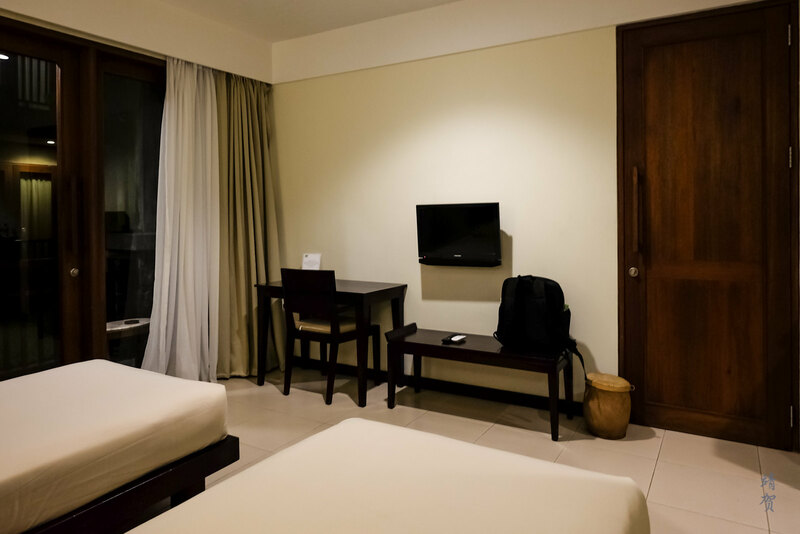 Across from the bed, guests can find a work desk and standard wooden chair with the flatscreen TV mounted by the wall. Below the TV was a low lying bench where the TV remote was placed. This bench serves as a useful storage area for bags and extra luggages. Beside the bench is a traditional rattan basket that hides the rubbish bin. Outside, the room has its own balcony with one chair and a side table facing the courtyard. I believe this space was created for guests who wishes to smoke as an ashtray was placed on the table. The walls on the balcony was unpainted cement giving it an industrial look but I figured it was just a way to save on paint for the hotel owners. 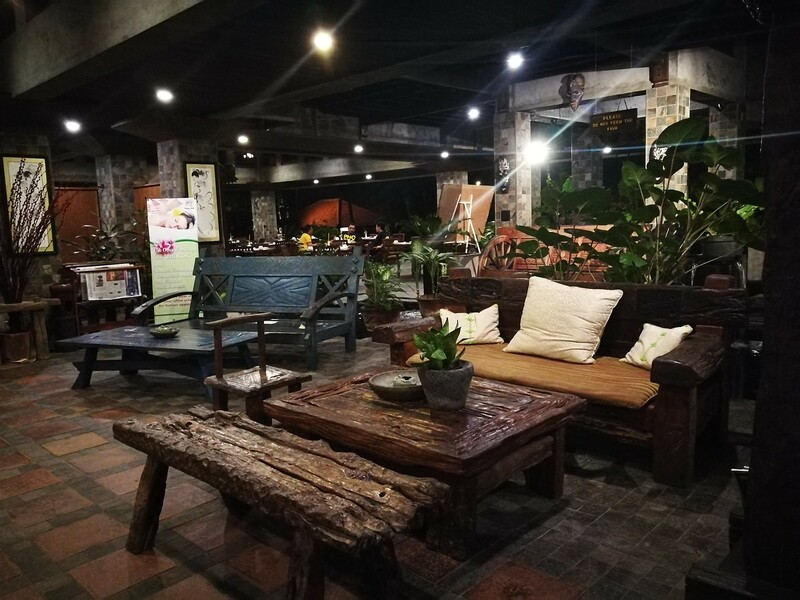 I had dinner and breakfast at the restaurant, and the dinner was quite good for a small town resort. Breakfast was served in the same restaurant that has an open air concept overlooking the gardens. It was definitely more beautiful in the morning as the gardens was brighter. 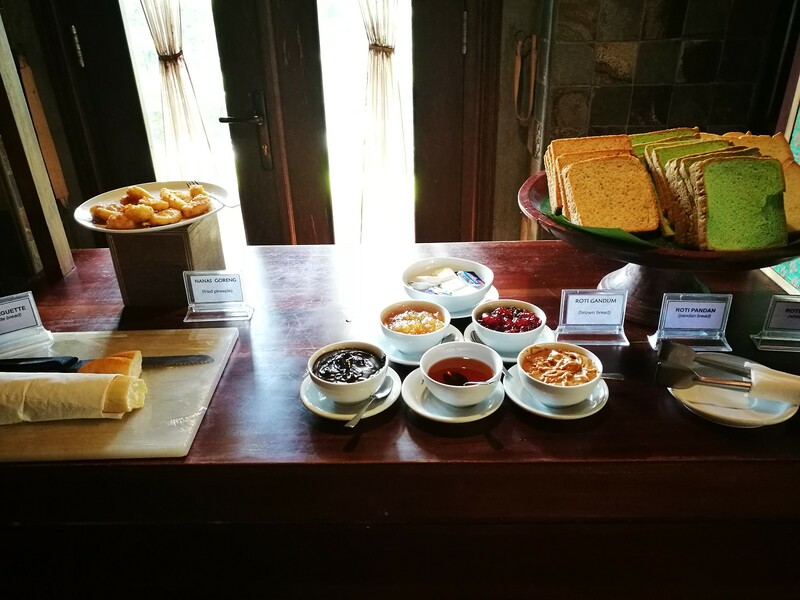 A buffet style breakfast was served and the variety served was great! 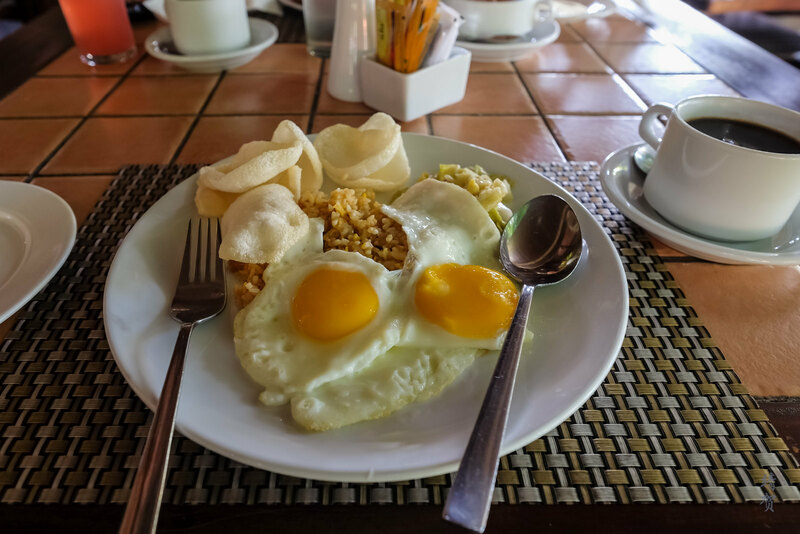 In many Indonesian hotels, bubur ayam (chicken congee) and soto ayam (chicken soup with turmeric) are commonly served. 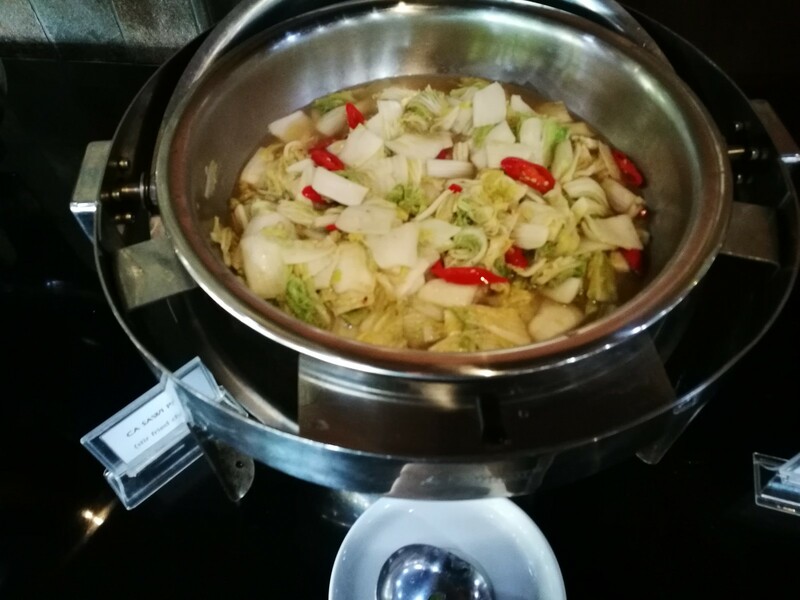 This property is no different, with individual booths to host these 2 dishes and their condiments, usually fried shallots, green onions, lime and chillies. There was also crackers to add to the soup. 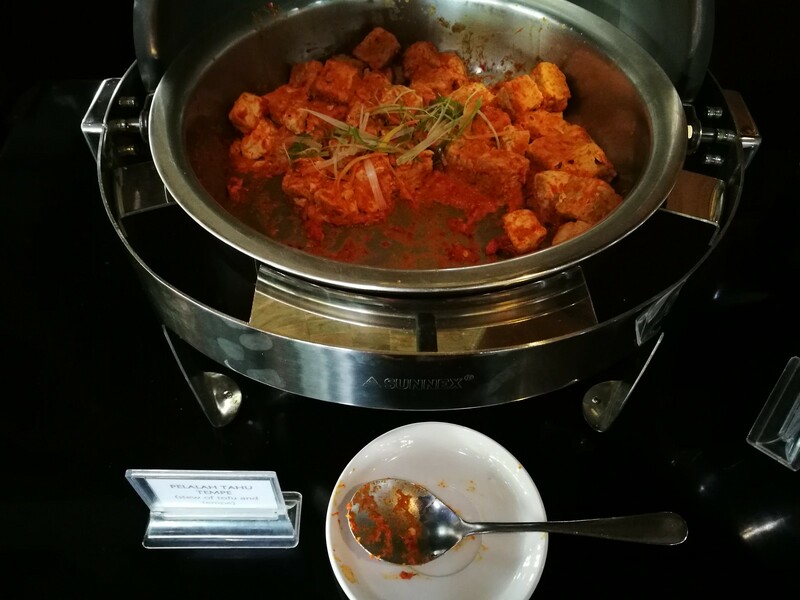 The main buffet section has cooked hot dishes such as fried rice and noodles, semur ayam (braised chicken), stir-fried napa cabbage, a stewed dish of tofu and tempeh (fermented soybean cake) in addition to common dishes like sausages. 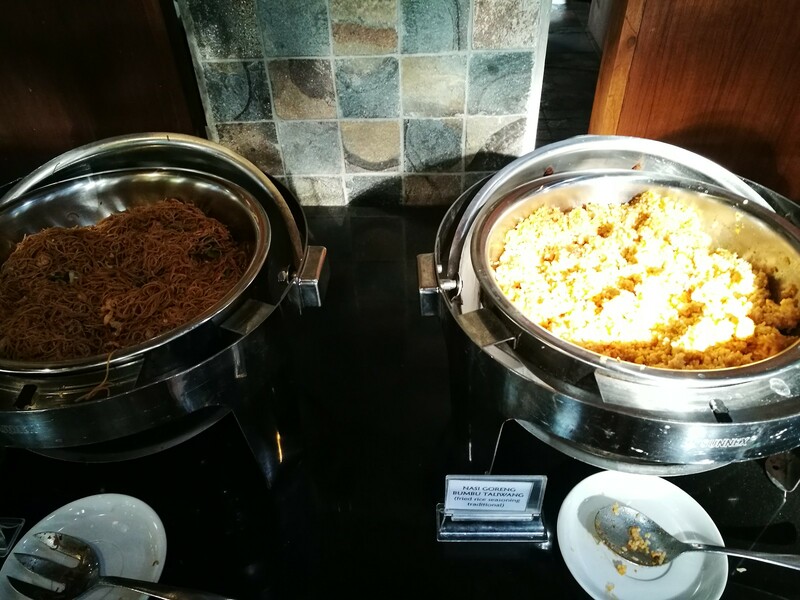 Nasi cawuk, or a traditional mixed rice with ingredients that guests could choose themselves was available too. 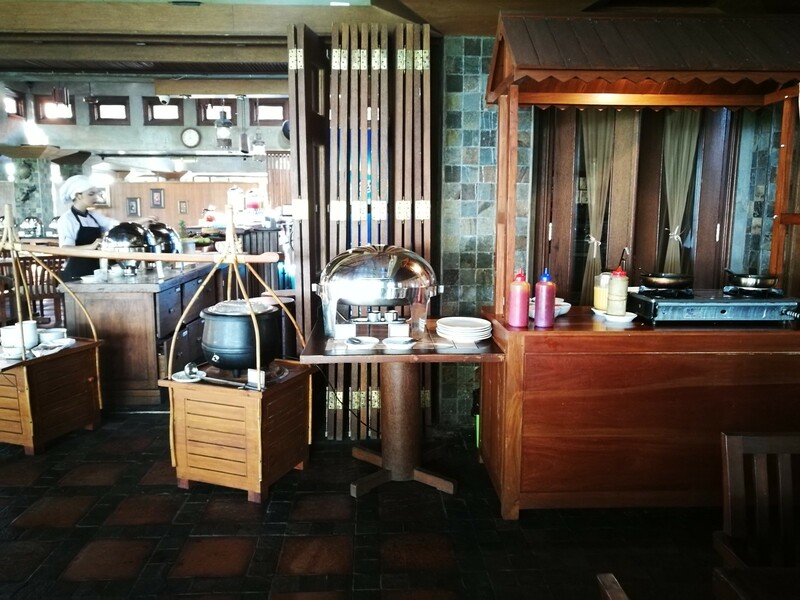 Another interesting feature was the hotel set up some of the stalls in the form of a street-food seller (warung) and guests could order some classic Indonesian street food for breakfast in addition to made-to-order eggs. There is even a station serving fruit fritters such as fried banana and pineapple as they are a favourite amongst Indonesians. 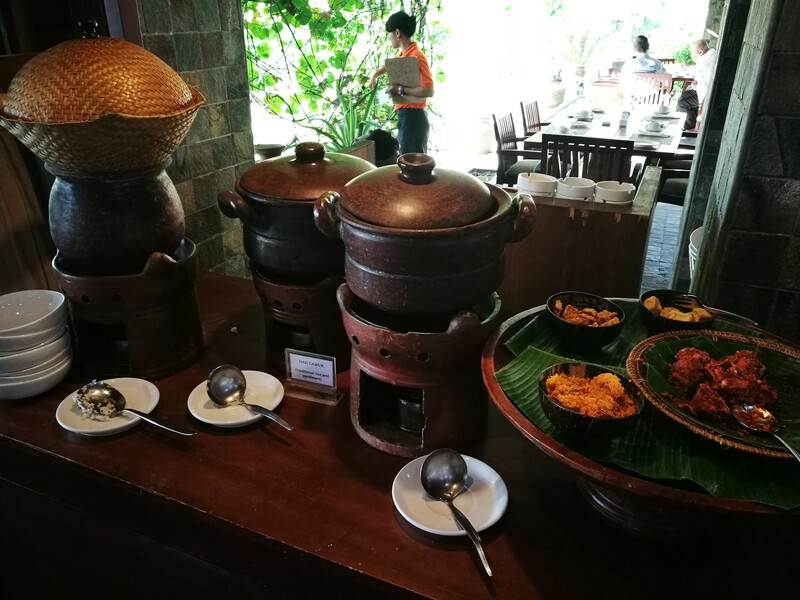 This was set up beside the toast counter where white bread, wholemeal and pandan was offered. 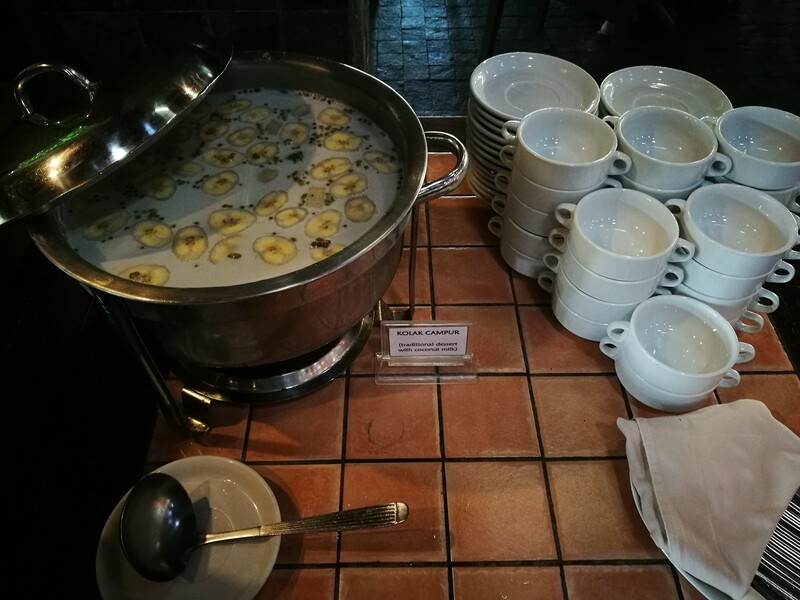 Desserts was available and I was pleased to find Kolak campur which is a coconut milk dessert containing bananas and tapiocas. This is a must-try if you are ever in eastern Java, as they are not a dessert commonly found. 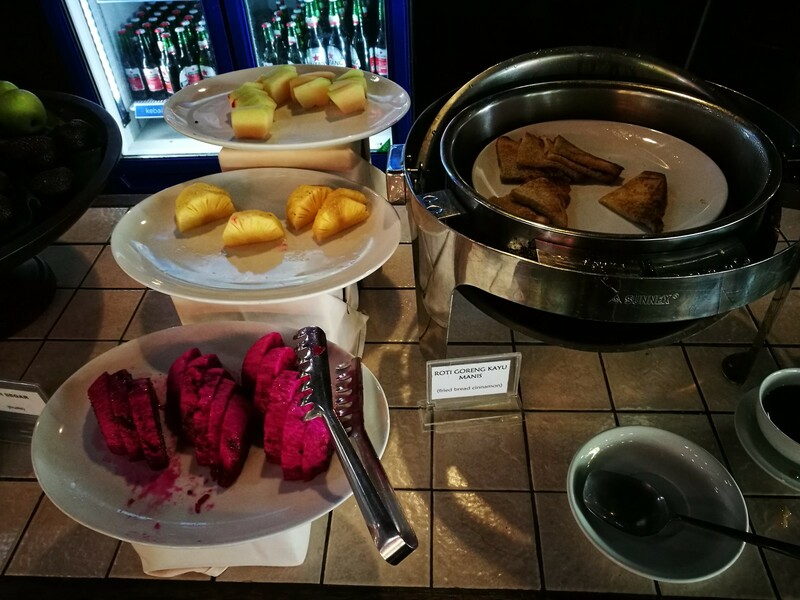 Other sweet options includes cinnamon French toast and a variety of cut fruits or tropical fruits like bananas, and salak (snakeskin fruit). 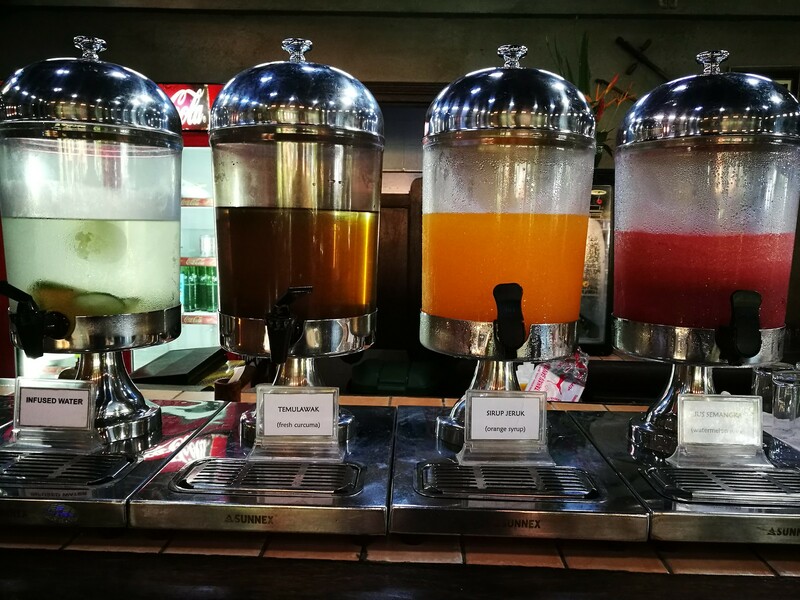 Temulawak juice from a fruit native to east Java is one of them offered in addition to bottled orange syrup and watermelon juice. Coffee or tea was also offered to guests while I never found out if the hotel has any espresso machine. It is likely guests have to settle for brewed coffee here with milk. 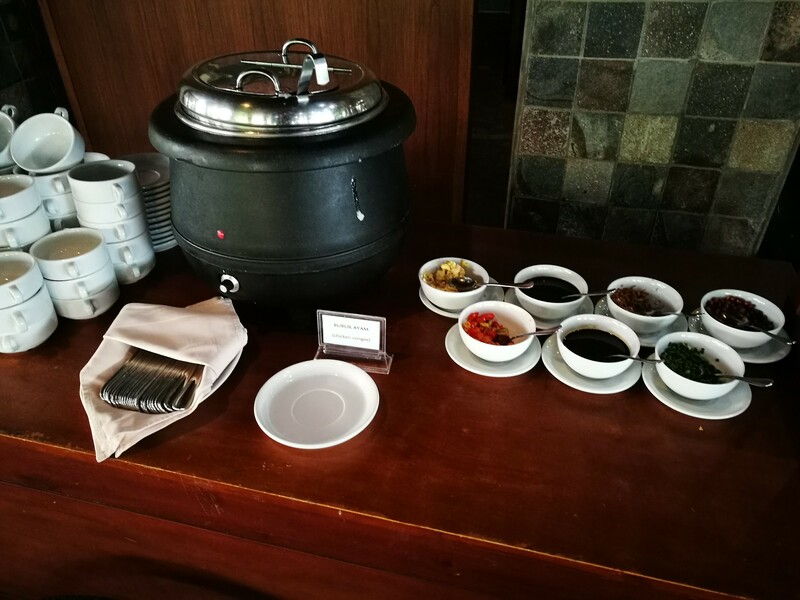 With the large variety offered, I was impressed with the Indonesian options and enjoyed this breakfast. I would definitely recommend guests to pay for breakfast here if it is not included in your room rate! 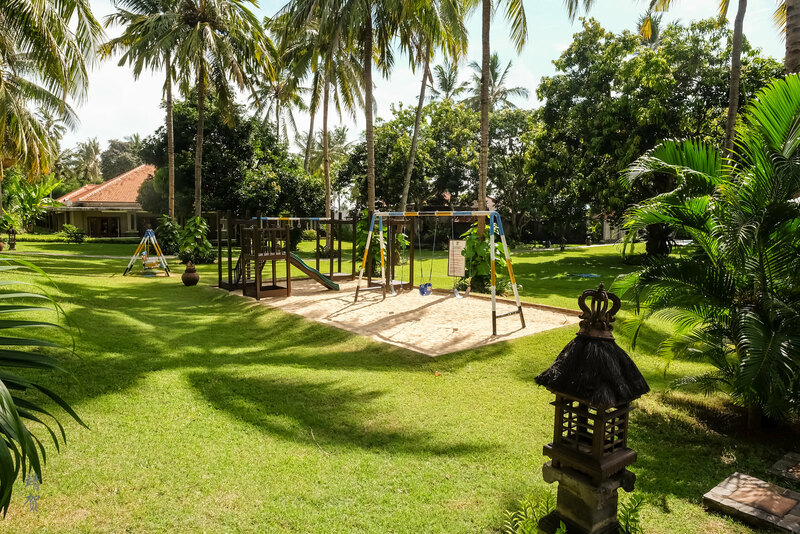 Other facilities in the hotel includes a playground in the large garden. 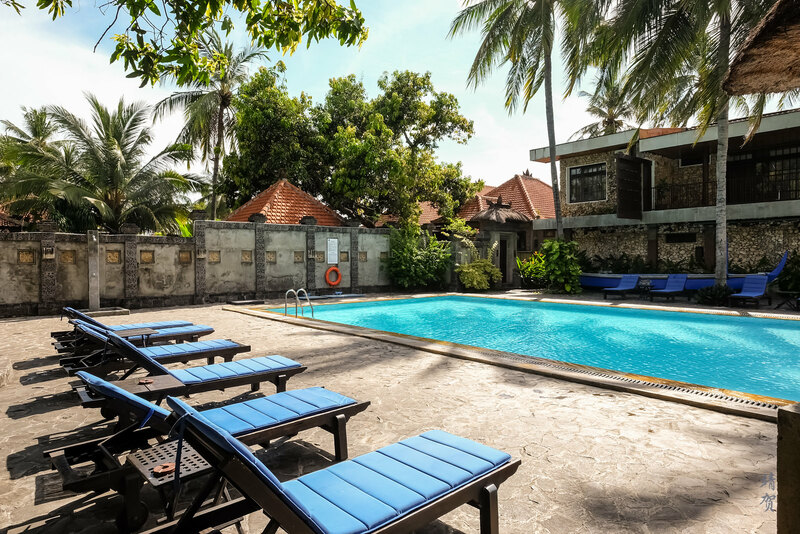 The outdoor swimming pool can be found nearer to the buildings containing the ocean view rooms. There are some places to sit down and lounge near and around the swimming pool though there is no beach accessible from the hotel despite the property’s waterfront location. However the proximity of Banyuwangi to the western end of the island of Bali means it is easily visible from the coast. Several rooms in the hotel are advertised with an ocean view though the area is public and these rooms are further back from the main building but closer to the swimming pool. My walk along the waterfront of the hotel allowed me to get a glance of a villa here which could well be one of the owners’ villa as it does not seem to be hotel building and neither was a villa advertised in the hotel’s website. My stay here for one night came down to around IDR400,000 (~$30) inclusive of taxes. While the bedroom was not the most luxurious it was sufficient for a rural area in Indonesia. And I would have found the cost even worth it for just the breakfast that was provided. As a summary, this was definitely one of the best value I got out of a hotel stay. 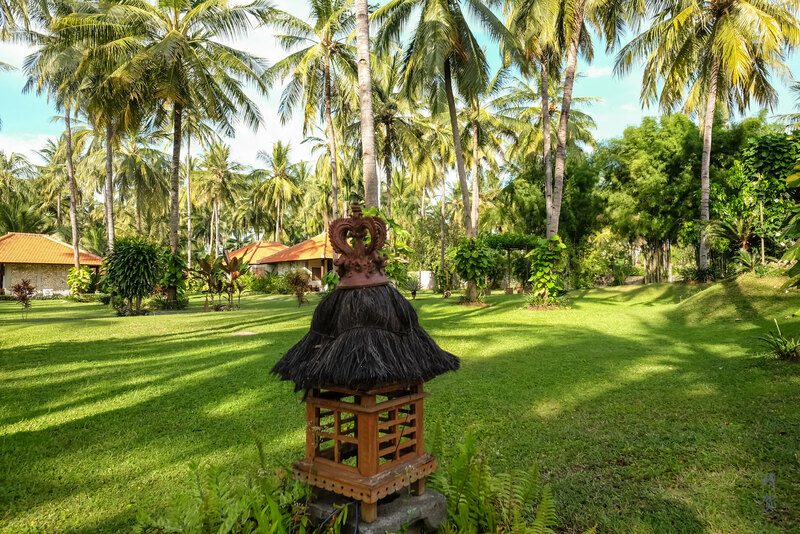 Ketapang Indah could be a very good option for tourists planning to hike in the Ijen crater or for visits to Banyuwangi and its surrounding if you have a car or arranged transport since parking is complimentary and there are plenty of parking lots. 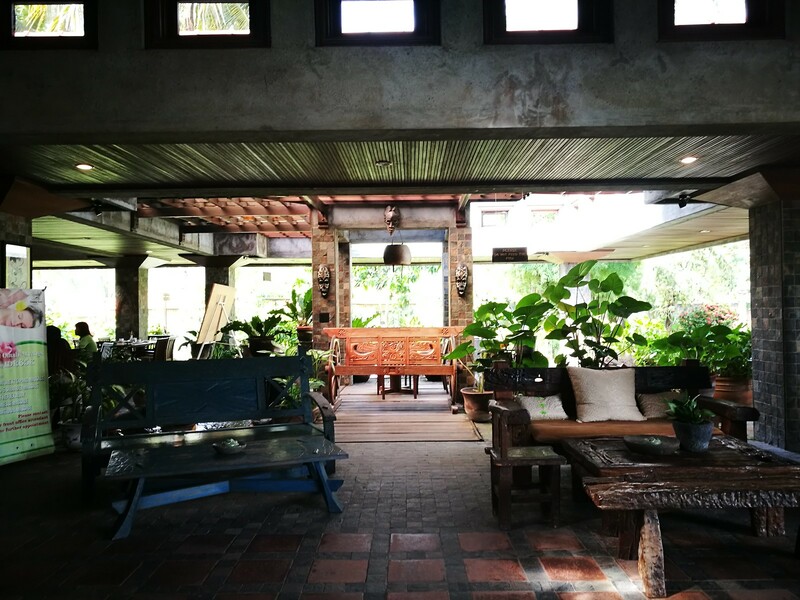 This makes it suitable as a stopover point for those planning a cross Java road-trip en-route to Bali as well.